Editor at Leghorn during the latter part of the eighteenth century. He is known especially as the compiler and editor of a little volume, "Shibḥe Yerushalayim" (Praises of Jerusalem) or "Shabbeḥi Yerushalayim" (Praise Ye, O Jerusalem, Ps. cxlvii. 12), on Jerusalem and the various Jewish centers in Palestine, especially on the graves and monuments of old Jewish worthies to be found there. The anonymous author has largely used the "Zikkaron Birushalayim" of Constantinople, 1743 (Benjacob, "Oẓar ha-Sefarim," p. 158, n. 152). Attached to this is an account of the journey from Venice to Palestine of some great teacher, who, starting on 17th Elul (1521), passed through Polia, Corfu, Zante, Tripoli, Beirut, Zidon, Safed, Tyre, and visited all the places of Jewish interest in Palestine; noting the condition of the Jews there, and the various places held sacred; an account of the Lost Ten Tribes and of Palestine, taken from the travels of Benjamin of Tudela. The work was first published in Leghorn, in 1785; then in Lemberg, 1799; Wilna, 1817; s.l. 1826; Warsaw, 1840; Jitomir, 1860; s.l. 1862 ("Hebr. Bibl." vi. 4). 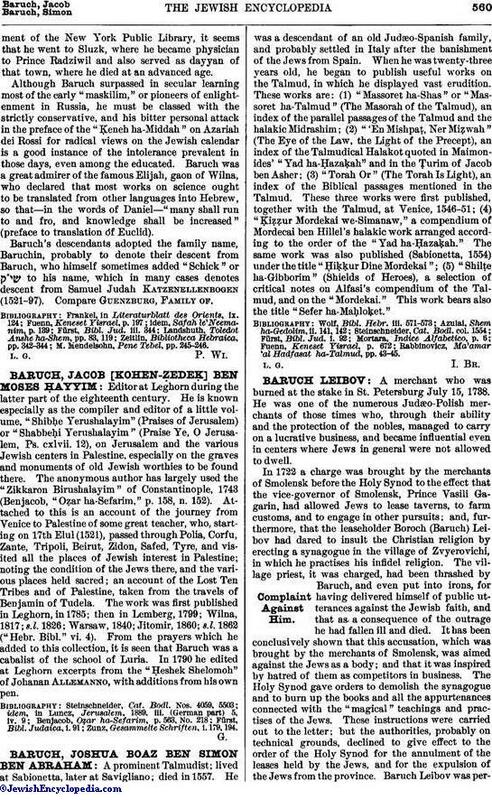 From the prayers which he added to this collection, it is seen that Baruch was a cabalist of the school of Luria. In 1790 he edited at Leghorn excerpts from the "Ḥeshek Shelomoh" of Johanan Allemanno, with additions from his own pen. Zunz, Gesammelte Schriften, i. 179, 194.